Not my best photo. I have found that lately, when I try to snap my photos I tend to shake the camera. So I have started trying to place my card and my camera on the same surface. It steadies the camera, however the pictures are not that great. So back tot he drawing board. That said, this card is entered into Crazy4Challenges #114 - black and white and one other color. Mine is black white and red. I've had this little stamp for ages. Every time I stamp it I find a love it even more. I've stamped it on colored cardstock and embossed with silver, gold and white. Never unhappy with the results. 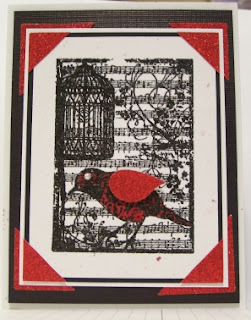 Today was no exception -- I stamped with Versa Mark and heat embossed with Sparkling Black embossing powder. Then I used my Cherry Cobbler marker and colored just the bird. What you can not see it is the wing is glittery red cs as are the corners. Thanks for looking. This is so pretty! First thing I noticed was the glittery red wing! Fabulous! Thanks for joining us at the C4C!